Can you handle a 1500HP Monster Truck that can crash cars, get massive air and pop wheelies with a blip of the throttle? 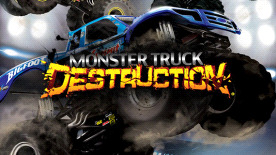 Monster Truck Destruction is here to satisfy all of these needs plus more. Choose monster trucks from the founding era with original rivalry between BIGFOOT ® and USA-1, or trucks from the 80’s, 90’s and today. Can you perform a ‘slap wheelie’ or a ‘flip’ to earn maximum points in freestyle? Will you be able to knock-out a blistering time in drag? If not maybe you’ll need to upgrade your truck so that it can be faster and go harder, but watch out if you go too hard your truck may break and cost you money to repair! Loads of fun for the casual gamer to the ultimate Monster Truck die-hard fan. GET IN, HOLD ON and LET IT RIP!